This Algebra 1 project was inspired by Fawn’s Visual Patterns site, and her Patterns Poster lesson. We do one of the Visual Patterns every Tuesday for our “Tough Patterns Warm Up” activity, but I thought this would be a great culmination activity to our functions unit. Students must write both explicit and recursive formulas in this unit, so the patterns project brings both together nicely. Instead of supplying students with the patterns this time, they created their own! I encouraged students to be creative and choose an image interesting to them. Students were given one class period to brainstorm ideas, start sketching, and write their equations. Once approved, they had about one week to make their posters at home. Some worked on the posters in school during homeroom, or at the end of a period if they finished their work early. When I do this project again next year, I will more strongly stress the array of the images. For example, the apples placed in the diagonal vs. the Olaf snowmen which were placed in simply a straight line. I love this project because it gives students a chance to be creative, and sometimes silly, but also because it directly relates to the math content we are studying. 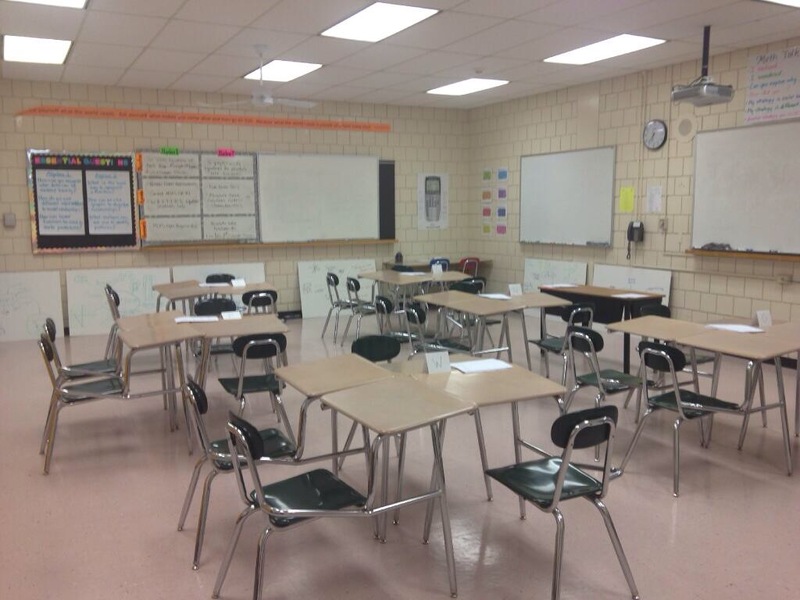 To review for major assessments, I like to set up stations labs around my classroom. They usually take about 40-60 minutes for most students to complete, though some students end up finishing some stations for homework. I make one master answer key and keep it on me during the activity. The students check in with me after completing each station so I can give them immediate feedback. If they work is completely correct, I either sign my initials or stamp their sheet, and they move onto a different station. It can be a little chaotic but I like knowing where each students stands as the period progresses. I make the students move around the room (although many would like to stay in one seat) so they are active and get a chance to work with different students. Hope your students enjoy them too! I wanted a quick and fun way to assess students’ abilities to solve equations during the first week of school, so I made this “Solving Equations – Add It Up” powerpoint. Each group of four students will have one large whiteboard on their desks (purchased from Home Depot – panel board that is cut up). Each student will solve the problem in his/her quadrant, then the students will add all their solutions together to get one final number which they will write in the middle of the board. I will only look at that final number and tell a group whether they are right or wrong. If a group is wrong, they will have to look at each other’s work and figure out where the error has been made. During the activity I will walk around and monitor student’s progress, keeping notes on my clipboard for future reference. If a group does not have 4 students, I will ask the student who finished his/her problem first, to also solve the 4th problem. If you do not have large whiteboards, you can still have students do this activity. Students can solve their problem on an individual mini white board or sheet of paper, and then combine their answers onto one sheet in the middle of the table. High School Math Teacher. Year 8. I am a teacher. This is my journey. Teach it. Learn it. Live it.